Start / Allmän info / Vacuum lifter for cardboard boxes. 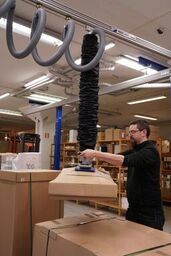 Vacuum lifter for cardboard boxes. Installation on an interior company for handling of cartons etc. Comment from one of the operators: It’s pretty good that when you go home after a days work, you don’t have pain in your shoulders and back. PRILIFT max load 50kg including quick connection and 2 different suction cups.